We pride ourselves on providing a professional, reliable and fast service to our residential, retail and commercial customers. Our service is available 24hours per day and your call will be taken directly by the locksmith who will be able to give you honest, professional advice and reassurance. Locksmart can meet all your locksmith requirements from upgrading your current locks to attending an emergency lock out. We are available to provide the locksmith solutions you need at competitive prices and all our work is fully guaranteed. 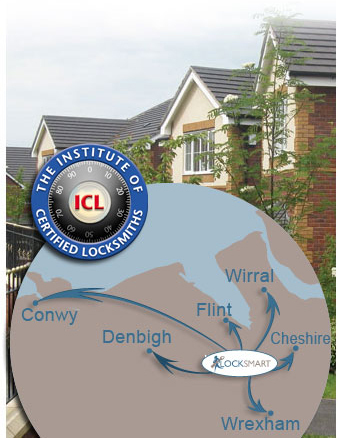 Locksmart is based in Buckley and also cover Mynydd Isa, Mold, Flint, Deeside, Connah's Quay, Queensferry, Holywell, Hope, Caergwrle, Saltney, Broughton, Ruthin, Denbigh , St Asaph, Rhuddlan, Dyserth, Prestatyn, Rhyl, Bodelwyddan, Abergele, Chester, Ellesmere Port, Whitby, Eastham, Bebington, Birkenhead, Neston, Heswall, Hoylake, Wrexham, Gwersyllt, Johnstown, Ruabon, Cefn Mawr, and Llangollen. Our commitment to you is to provide the ultimate in service, quality and value. We value your custom, and take every enquiry seriously. 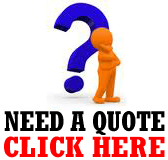 We offer free estimates and will visit each customer and work together to tailor the job to meet individual requirements and budgets. We pride ourselves in our professional workmanship, from arriving in a timely manner, consulting the customer throughout the job, keeping a clean & tidy work space through to completion of the job, leaving only when the customer is completely satisfied. Any aftercare enquiries are dealt with quickly and professionally. All Upvc door lock mechanisms supplied fitted or repaired.